It’s getting cold and the weather start to change here. In time like this, when I got asked the magic question, “what do you want to eat?” I just asked back “what is a good Japanese food to eat on cold weather?” After went through a rough list, we doubted to choose between shabushabu or sukiyaki. Lucky for us, we spotted one restaurant that serves both since the season changed. So we headed to downtown Kyoto, on Sanjo Karawamachi area. The left side of the second traffic light from Kamogawa river, we walked towards Rokkaku area. On the second floor of Dekku bai koosuto (Deck by coast) building, we found Japanese traditional restaurant called Tanuki Rokkaku. Good news for us, they have offered hot pot menus whether as a set or all-you-can-eat package since September. Shabu shabu and sukiyaki are both Japanese hot pot dishes which self cooking by simmering the tender meat pieces and fresh vegetables into broth or sauce on the pot. I was totally excited since it was my first time eating the real shabu shabu and sukiyaki in Japan. Although in Jakarta you can find many shabu shabu restaurants, the taste has been adjusted to match with the local. What I found strange is that the popular broth or soup based is either kimchi or tomyum. As you know they are definitely not Japanese. But I could understand the business point of view, since most of Indonesian are much favorable with more spicy taste. The differences between the two dishes are the taste of the simmering soup or broth and the dipping sauce. For sukiyaki, often the meat and vegetables simmer on the pot with sweet soy sauce. The liquid is less amount and easier to absorb. Making it easier to burn as well. When they are well cooked, the ingredients usually dip into raw egg before you can finally enjoy the dish. I really think that using raw egg as dipping sauce maybe only possible in Japan. Japanese egg is sweeter than the one you can normally find abroad. It’s totally fine to eat raw egg in Japan. In fact, Japanese people often have raw eggs mixed with rice as their breakfast. While for shabu shabu, the ingredients simmer in more watery and more savory broth. You can boil them a little bit longer until well cooked. There are two popular dipping sauces for shabu shabu, ponzu sauce and sesame sauce. When the meat and vegetables are all finished, Japanese people usually put udon noodle into the soup. And the meal is completed. Back to the restaurant, the waitress first came with one plate tsukidashi or appetizer of takowasa (chopped octopus with wasabi sauce), chikuwa (fish cake) and edemame as free services. Then, she set up the table with mini stove, one large boiling pot, two dish boxes of beef, another box of various vegetables, one bowl of eggs and two pots of sauce. 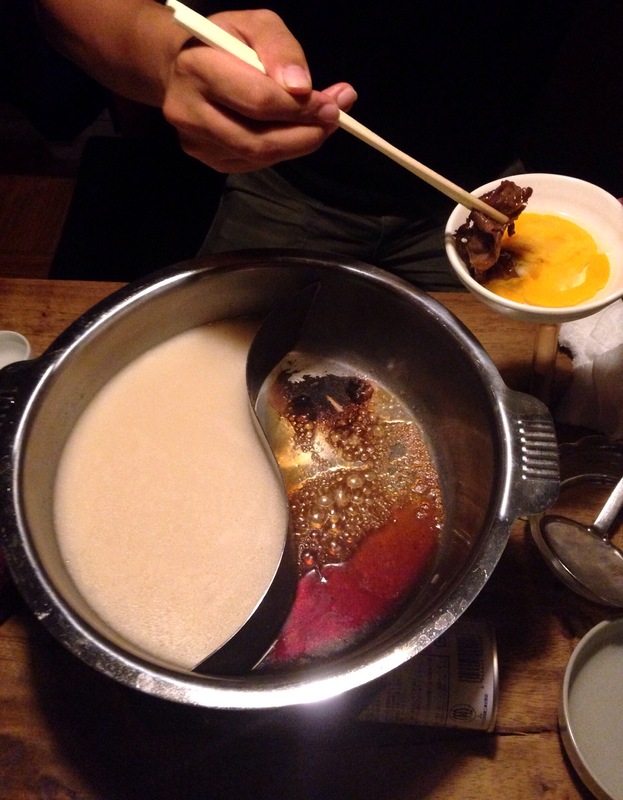 The hot pot divided into two, one part was for sukiyaki and another was for shabu shabu. And later after the main part was finished, she came back for udon noodle into the shabu shabu broth to complete our meal. It was incredibly great yet still very much Japanese flavors. My body indeed warmed up into sweet-savory meats and vegetables. It was totally fit into my definition of a good japanese food which focus on good quality taste of the meat and vegetables cook with light but well balance of sweetness or saltiness sauces. The price which was around 3000yen definitely worth the tasty meal and cozy atmosphere. 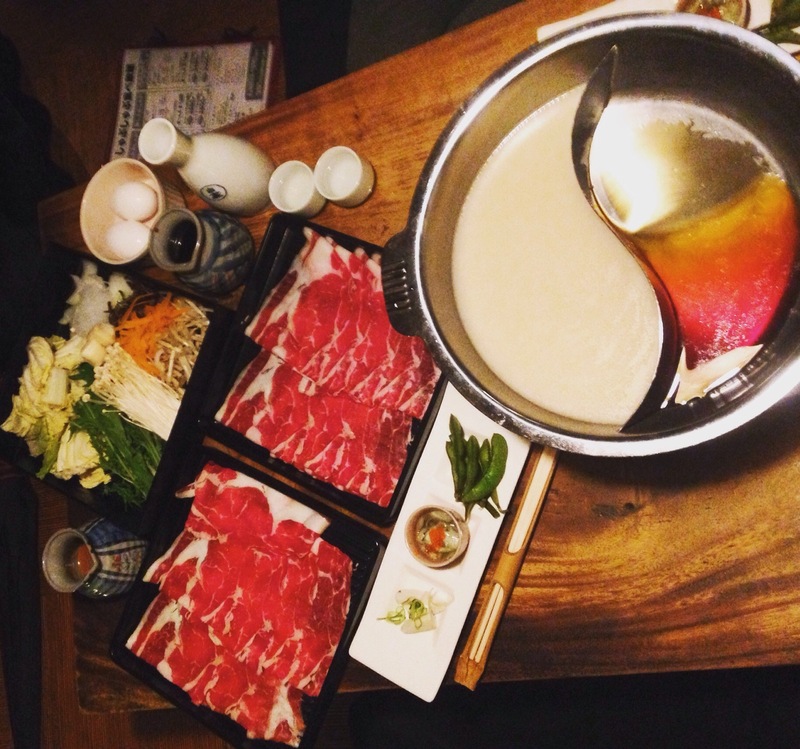 The sukiyaki and shabu shabu package is absolutely recommended whether you are in small or big group. 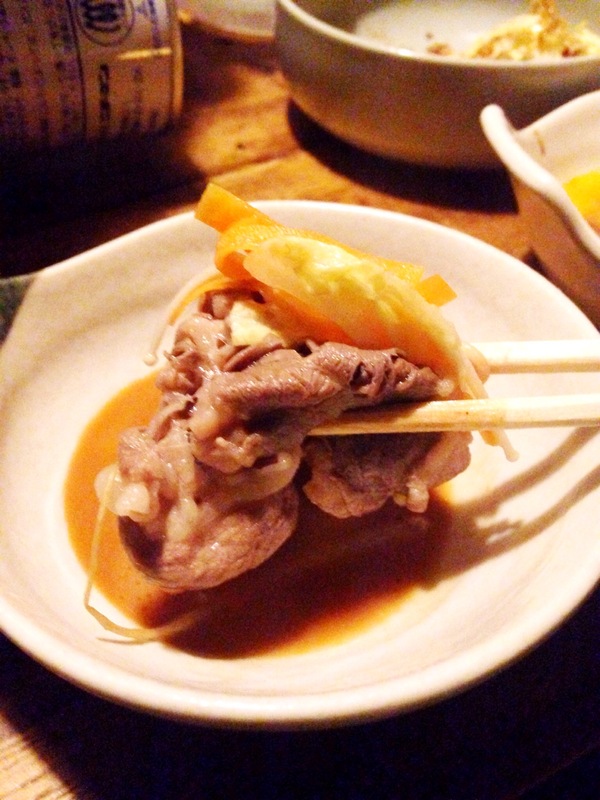 If you are not in the mood for either sukiyaki or shabu shabu, you still can enjoy other typical izakaya menu, especially the yakitori is the restaurant’s speciality. 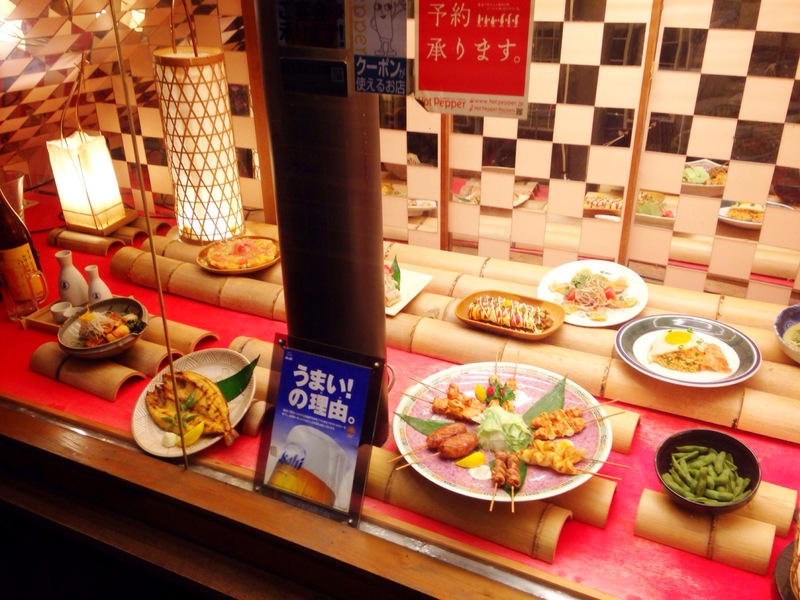 This entry was posted in Chiyo's world, Food and tagged culture, food, japanese, kyoto, local. Bookmark the permalink.